"By the end of this year," Defense Secretary Robert Gates says, the Taliban should be to the point where it's willing to take part in formal talks aimed at bringing peace to Afghanistan. But, he said during a conversation set to air on today's All Things Considered, the Taliban must "put down their weapons ... abandon [any ties] to al-Qaida" and agree to live "under the Afghan constitution." Those are conditions laid down by Secretary of State Hillary Rodham Clinton back in February during a policy address she gave at the Asia Society. 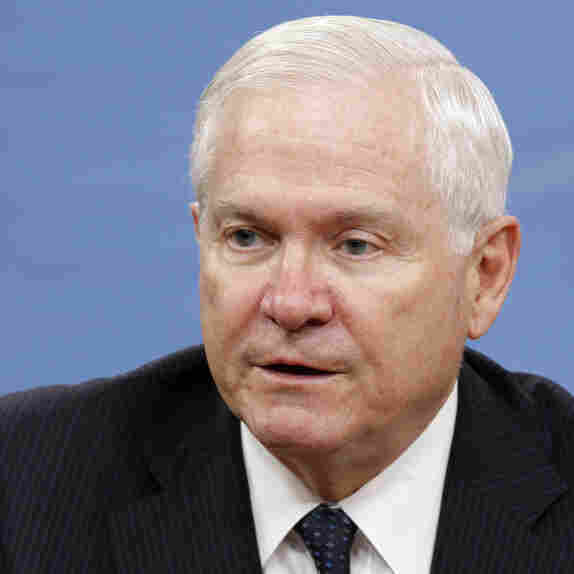 Gates believes that time is approaching, he told NPR's Robert Siegel, because pressure from the U.S. and its allies has created an environment in which the Taliban will soon realize it can't win. There have already been reports, Robert noted, about reconciliation talks with representatives of Taliban leader Mullah Omar. Are the U.S. and its allies willing to deal with him? As wars conclude, Gates noted, it is inevitable that "peace is made between people who have been killing each other." The Taliban, he added, is "part of the fabric" of Afghan politics. Gates is retiring later this month. Here's part of the conversation he had with Robert. Later, we'll add the as-aired version to the top of this post. Thursday, All Things Considered plans to broadcasts part two of the interview.